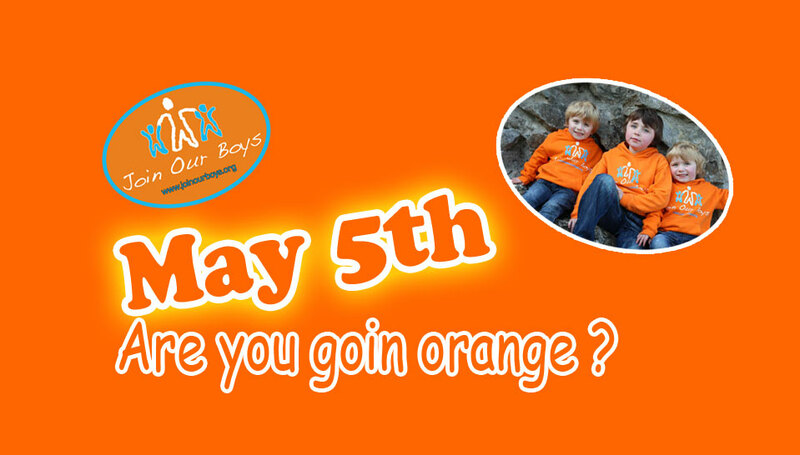 Remember ‪#‎WearOrangeDay‬ is to raise awareness and funds for a GLOBAL Disease. It does not matter where you are in the world, YOU can make a massive difference! 2. Get a group of pals together in ‪#‎Orange‬ and do the same? 3. Hold an event at home, at work, in your church, in your school, your college, your sports club or in your community – any event to raise awareness of the disease. A coffee morning, a Quiz, a cookery demonstration; a raffle; a fun run, a ‪#‎KeepMovingChallenge‬ …ANYTHING at all! Get in touch with us if you want to do this – we can help! 4. Start thinking about an event you can plan over the next year that will promote and support the aims of The Join Our Boys Trust. Sadly this campaign is a marathon, not a sprint – we are here for the long haul. 5. Encourage everyone you know to support us on social media – as this is vital to rasie awareness. We appreciate that there are so many good causes that deserve your support and we are so grateful that you take time to continue to support Archie, George, Isaac and everyone else with this Catastrophic Disease.